"It's like to breath a purer and fresh air and to live, at last, without fear", it is an image I can use to describe Liberia that after the Ebola nightmare is "slowly" raising standing. The Salesians of the Don Bosco Sean Devereux Matadi e St. Joseph 8th Street are now busy in projects supporting to 1200 boys and girls "to not remain on the street." We welcome forces, convey energies, organize, animate. With the help of the benefactors "We help families in difficulty to pay taxes and to buy books for children: this year we reached 253 sponsorships." Liberia is one of the poorest countries in Africa. The civil war fought between 1989 and 2003 caused about 250,000 deaths. Ebola, in this sense, it was just a new emergency. 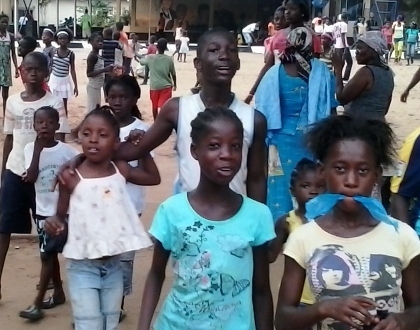 It has been faced and it is faced with dignity and even love witnessed by the courage of the many young people of the Salesian Centres of Monrovia in fighting infection through information, prevention, distribution of medical supplies and food. "To see them was a great reason for hope." Looking at these past months now, it is possible to judge with equipoise, understanding and explaining them better. "It's like to breath a purer and fresh air and to live, at last, without fear, fear of being infected with an incurable illness, to be in need of a hospital and did not find it open, having to help an infected relative or friend, to be seized by the 'task force' and transferred to the isolation centre, ending in an incinerator instead of having an honourable burial. " The end of the national emergency has been confirmed a month ago by the World Health Organization (WHO). After more than 4600 dead, actually it looks more like the beginning of a convalescence marked by hope. "The offices are reopening, while the movement of people and trade are returning to normal, the schools have resumed classes and the Government and International Institutions are working because clinics and hospitals are operating at full capacity”. The precautions are many, starting from the requirement to wash hands frequently with water and chlorine to disinfect public places. We are aware that "the emergency has further weakened the poorest families and amplified already existing situations of people at risk". According to ‘Liberia multi-sector assessment, April 2015’ document the interviewed population focused as the social group most in need of help the underage girls, pregnant or already mothers, when you consider the age group between 15 and 18 years. The other at risk category are the orphans. According to UNICEF, more than 3000 children due to Ebola have lost one or both parents. These emergencies are going to be added to many other hardships. Just think that according to data released in March 2015, in Liberia 31% of schools have no functioning bathrooms, while only 60% have drinking water within 500 meters. However, today the country is less unprepared to health caring. "Against any return of the virus other health centres have been built with more than 400 beds; in the meantime some of these are used as clinics available to Liberian ". As during the Ebola time I was writing that was the time the purification of our faith, now is the time to give reason to our hope.